We really didn’t have a plan as to where we were going after we arrived in Bangkok…and, as we’ve discovered, even if you *think* you have a plan, SE Asia has other ideas for you. Jeremy remembered that a friend of ours from SF, Jeremy Sugerman (I will refer to him as “Sug” to avoid confusion), is often in Thailand for 6 weeks around January/February, so we emailed him…and sure enough, he was in Krabi, a small beach town in Southern Thailand near Phuket which is known as “Climber’s Paradise” due to the fact that it is surrounded on all sides by enormous limestone cliffs. 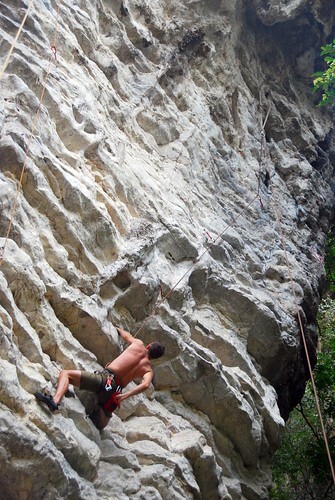 We’ve heard about Krabi for years because many San Francisco climbers often visit. That, combined with the fact that Sug was there, was all the reason we needed to head down south. 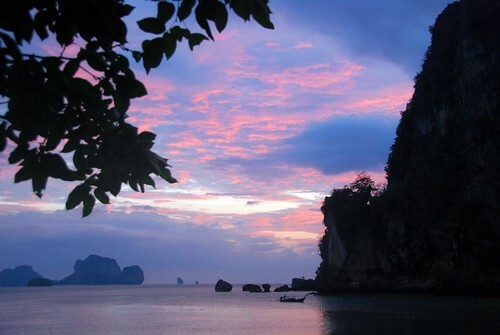 We booked a flight to Krabi in Bangkok. In SE Asia, you can book airline tickets the day before you want to leave, and they’re still pretty cheap. Also, the price a travel agent can offer can be cheaper than one you can find on the internet. We spent about 2500 baht (approx. 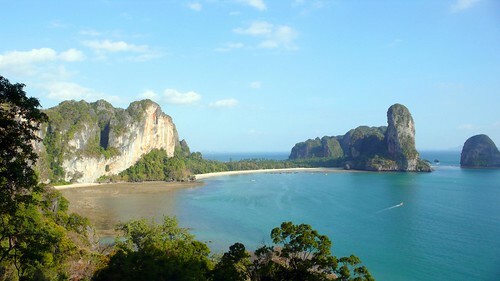 US$75) per person for a one-way flight from Bangkok to Krabi. This isn’t a rock-bottom price, but given the fact that the bus ride to Krabi is 10 hours long, we decided to spend the dough. 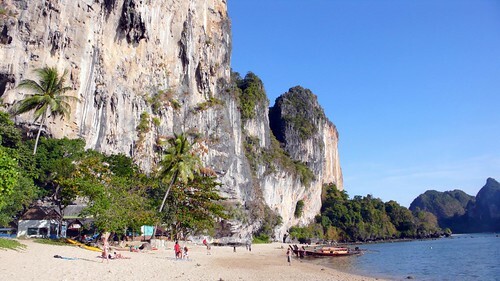 Sug was staying on Hat Ton Sai in Krabi, a tiny beach area accessible only by boat. 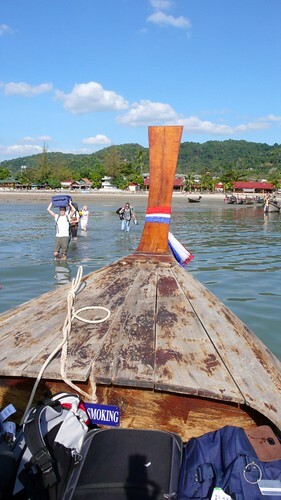 So, after we got off the plane in Krabi, we took a bus to Ao Nang, where we boarded a longtail boat to Ton Sai. That’s a lot of different transportation for one afternoon! It was low tide where we got to Ao Nang, which meant we had to walk through the water to board the boat since they can’t get to shore (and there is no pier). Thank goodness we have hybrid wheelie/backpack bags! We had agonized over this decision before we left on our trip—Jeremy just wanted a wheelie duffel bag and I insisted that he find a bag with backpack straps. In true Hermann fashion, Jeremy found the bag that worked for him, and then rigged up a backpack using detachable straps. Hey, whatever works. I felt really bad for the people who didn’t have backpacks. None of us expected that we would have to haul our bags across the beach and then through the water, but it was extra tough for the non-backpackers and some of their bags got quite wet. The boat ride into Krabi is really beautiful. Krabi is a stunning place—it is quite dramatic with all the rocky cliffs—and the landscape is very different from other parts of Thailand. 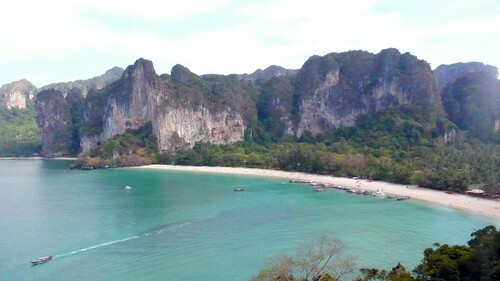 View of Rai Leh beach from Thai Wand, Ton Sai is the next beach over (to the left). Sug had hooked up a room for us at Dream Valley Resort, where he was staying. 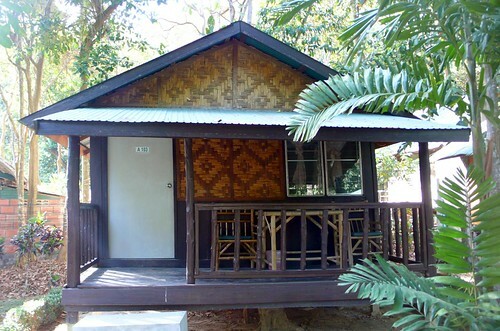 Our bungalow was cute from the outside, but quite basic inside, and at 650 baht (approx. US$18.50) per night (including breakfast), it was one of the cheapest places to sleep. This means Ton Sai is not the most economical accommodation in Thailand, but it is certainly a lot cheaper than the next beach down, Hat Rai Leh, where rooms can go for at least 2000 baht per night. Ton Sai is run on generators, so you only have electricity in your room from approx. 6:30PM until 8AM. At least you can run the fan at night! A few more details: the toilets do not flush (you have to dump a bucket of water down the loo), the showers are cold, and the beds are HARD! Even for Jeremy and I (we love a firm bed), these beds were like concrete slabs. So, very basic indeed! Our bungalow at Dream Valley Resort. But most people are not in Ton Sai for the accommodation: they are there to climb. Literally, every rock wall you see has been bolted and there are people climbing it. It really is a sport climber’s paradise. Given that Jeremy and I have not been on a wall for over a year (and probably at least 5 years since we’ve been on real rock), we didn’t pack any gear with us on our trip. But it’s easy enough to rent shoes and a harness here on Ton Sai. 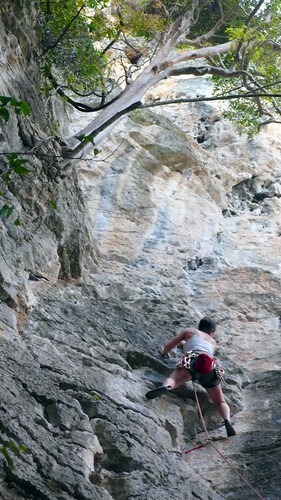 Climbing on Ton Sai beach. Our first day out, we went with Sug, Janet (a great gal—Sug’s friend visiting from SF), and Sug’s friends Chris and Kindy (who have a gorgeous house in Rai Leh) to Thai Wand wall, and then to another location (I forget the name). NOTE: We took to calling Sug the “Mayor of Ton Sai,” because he knows EVERYONE! He has come to Krabi for the last 9 years (and he stays 4-6 weeks each time), so he truly is the mayor. And, the awful truth: I was pumped out after two climbs. Jeremy managed to finish 4 climbs that day. We ended the climbing day with beers at Sawasdee bar at sunset. Sunset on Ton Sai beach. The Jeremies watcing the sunset from Sawasdee. In fact, this is part of the general “schedule” of events every day on Ton Sai: get up early, eat breakfast, climb, lunch at the chicken ladies (some women who have food stalls by the beach selling yummy grilled chicken), climb more, beers at Sawasdee bar at sunset, followed by dinner at Banyan Tree. Jeremy and I couldn’t take part in this daily routine the following day because we were SORE. Oh my, a year off the rock and we were little weaklings. 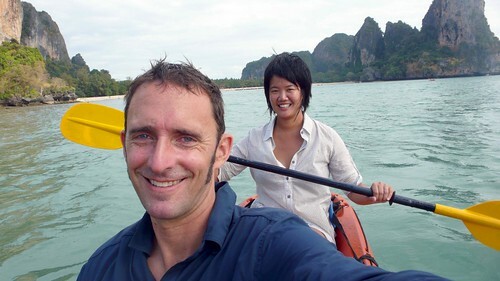 So, we decided to go out sea kayaking. Hey, guess what? It turns out that the same muscles you use to climb are the ones you use kayaking. So, it wasn’t much of a rest day for us. Jeremy and I planned on staying in Ton Sai only about 3 days or so, but then, as I said earlier, SE Asia had other plans for us. Jeremy came down with a case of “Ton Sai belly,” a stomach virus that kept him bedridden for about 24 hours. So far, I had escaped the virus (Sug had it the day before), so I went out climbing at Eagle wall with Janet and a cool German girl named Hannah. Taken from the summit at Eagle wall. Again, my limit was two routes, but this time it wasn’t my muscles but my belly: I felt the rumblings and the cramps…I had came down with the virus too. Let me tell you, it’s no fun being stuck in a bungalow with no air conditioning (much less electricity) when you’re sick. And, the bed felt even harder than hard with all our achy muscles against it. But honestly, it wasn’t so bad for our first time being sick. It only lasted a day and the cramps definitely weren’t as bad as the times I had food poisoning. Besides, we need to toughen up our stomachs if we are going to make it through Asia. But I don’t want to end on to sour a note. We had a great time climbing again and it was fun hanging out with Sug and meeting Janet. 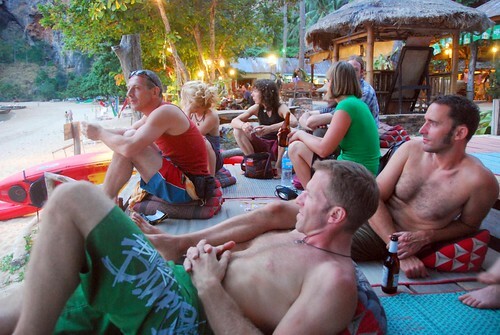 We met a lot of cool people who helped us figure out where to go in SE Asia and how to get there. But in the end we were glad we were only spending a few days in Ton Sai.